It is the season for knitting with lovely woolly Aran style wool. 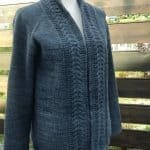 Winter in the South Island of New Zealand is looming….. A few months ago I decided to tackle “Beccs” by Isabell Kraemer, knowing that I needed to replace an old black cardi that was looking past it’s best. Maniototo Aran style wool absolutely loves cables! 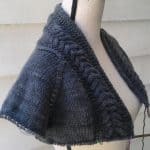 I chose “Dark Greywacke” for the cardigan. 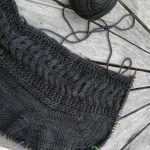 Knowing that our Aran style wool yarn can “grow” ever so slightly when blocked, I made it one size smaller than I needed and used 5mm needles. I didn’t want it to be a huge, sloppy garment. It is knitted from the top down, so great for trying on as you go. 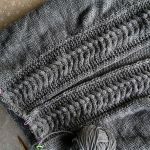 The sleeves are knitted in the round using the magic loop method. There are no seams. Here’s a look at the cable which travels all the way down………………. (The picture shows the colour a bit greyer than it actually is). The design is very clever. I haven’t made an I cord binding before, and I really like the firmness it gives to the edges of the cardigan. The shaping down the sides of the body takes place in a reverse stocking stitch strip. One thing I really hate is narrow armholes and a tight upper sleeve, so when it came to picking up the stitches for the sleeves, I followed the instructions for the biggest size allowing a lot more room, even though the sleeve was still quite slim. I knitted the sleeve on these extra stitches until just below the elbow then started decreasing. ©2018 Maniototo Wool. All rights reserved.